Yeah, I know I keep subtitling “State of the art Japanese animation” whenever I review one these Japanese cartoons. It was the old moniker of Streamline Pictures, one of the first serious distributors of Japanese animation on this side of the pond. After Streamline Pictures came other distributors such as Manga Entertainment, most famous for bringing the Mamoru Oshi’s Ghost in the Shell stateside. But they were also known for another release: Ninja Scroll. For tonight’s review we leave the comforts of those 80s Cannon Films ninja classics and head over into the world of gratuitous, ultra violent Japanese animation. Yes, Ninja Scroll is another one those “not for kids” deals. 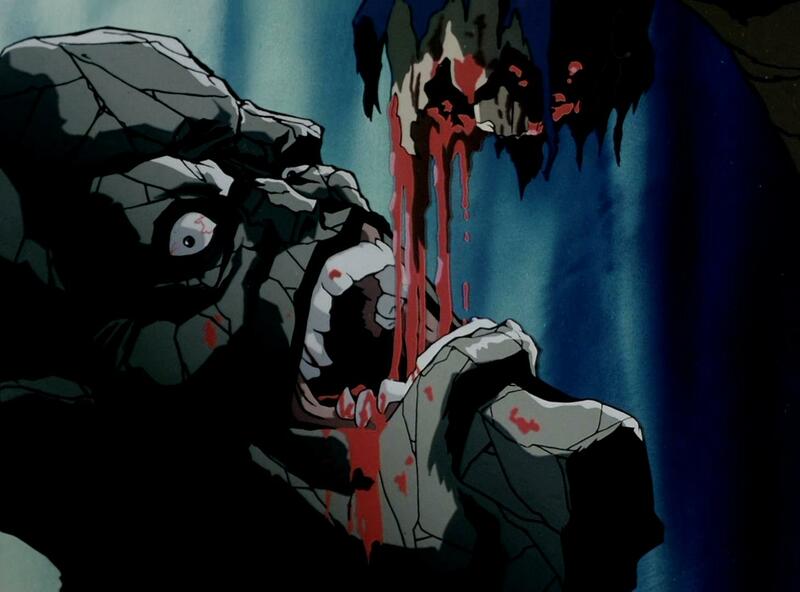 There’s one scene in particular where one of the eight devils of Kimon, a large ogre with the ability to turn his skin into stone, rips the arms off of this poor ninja and dangles the loose limbs over his mouth so he can drink his blood. That was good old-fashioned nightmare fuel when I first saw this. 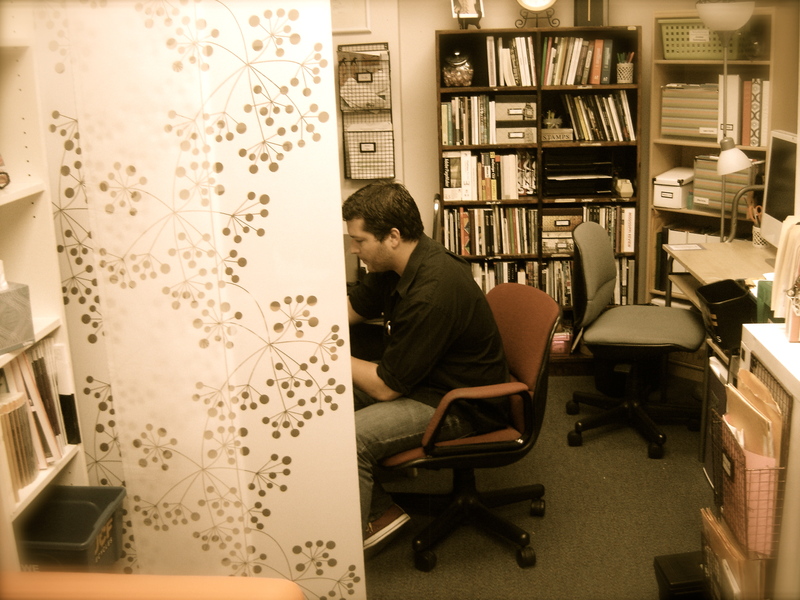 I was 18 at the time. 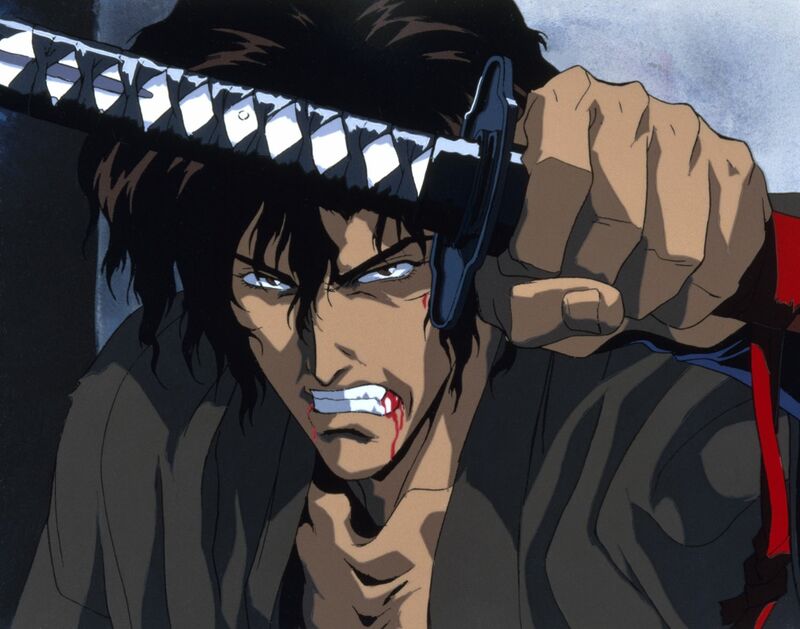 Like most movies that shock me when I first watch them, I’ve revisited Ninja Scroll over and over again. What brings me back? It might be the villains. This is a gauntlet picture where the hero has to fight his way through a succession one on one fights with increasingly difficult opponents with varying abilities. Kind of like Rugter Hauer in Blind Fury. (Say, why haven’t I reviewed Blind Fury yet?) 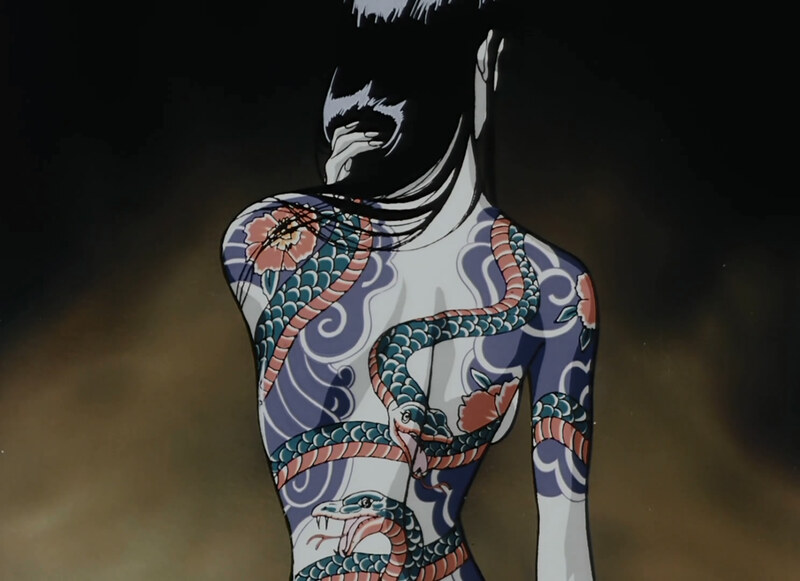 Anyway, the gauntlet in Ninja Scroll is comprised of the 8 Devils of Kimon. We have the stone ogre as previously mentioned, a snake woman who can shed her skin, a hunchback with a wasp’s nest on his back, a blind swordsman, a shadow assassin, a girl made out of gunpowder, a man who can kill people with invisible wires and shock them with electricity from his body, and their leader, Gemma, who can regenerate cells. Seriously, cut his arm off and he’ll just reattach it. 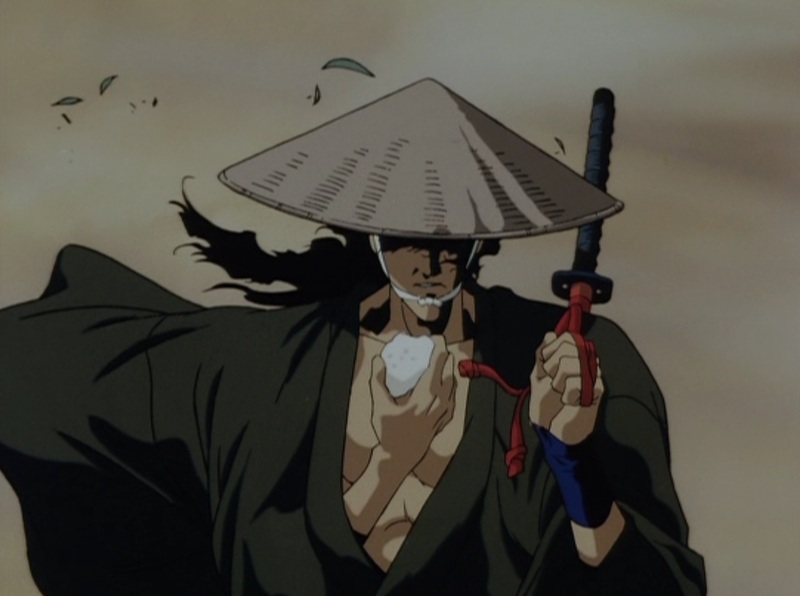 Our hero, Jubei Kibagami, is a wandering man-with-no-name type like the kind found in Clint Eastwood westerns, except substitute the old west for feudal Japan. Jubei gets poisoned by an old man who will only give him an antidote if he stops the 8 Devils of Kimon who have allied themselves with the Shogun of the Dark (more ninja bad guys) in an attempt to overthrow the government and rule Japan with an iron fist. Jubei is joined by a beautiful female ninja, Kagero, who is an expert at poison tasting due to the fact that she’s poisonous herself. Anyone who touches her will die. 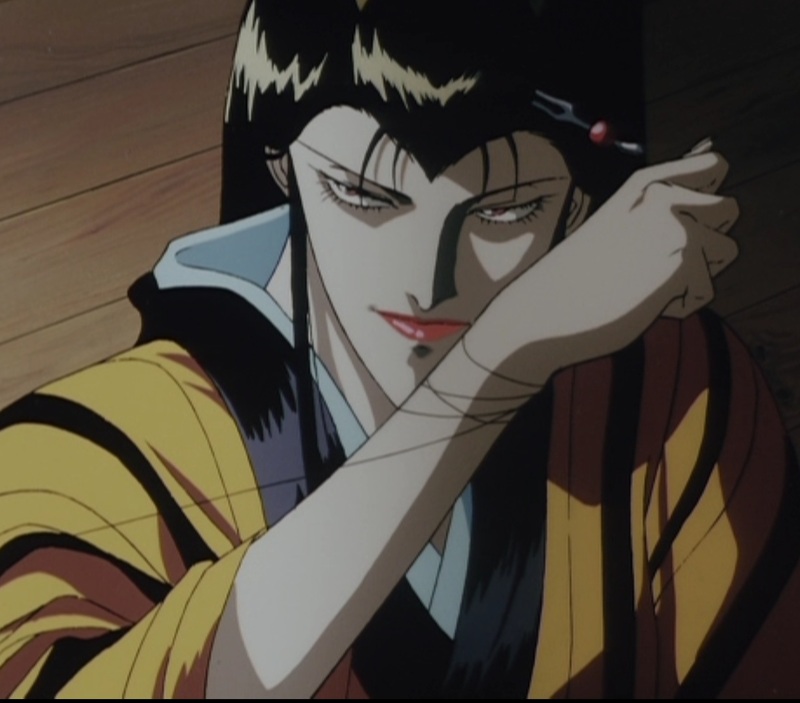 Ninja Scroll was directed by Yoshiaki Kawajiri, famous for his Vampire Hunter D movies. 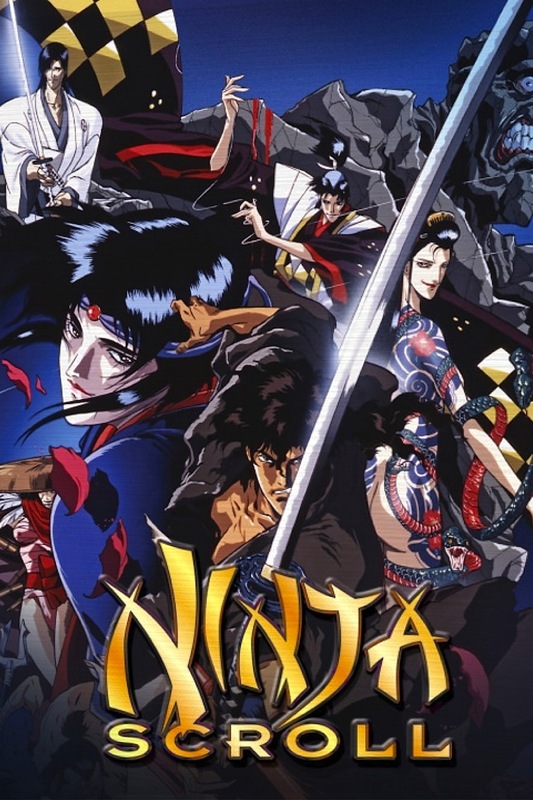 Ninja Scroll was also adapted into a TV series that’s worth checking out. Kawajiri has also been trying to get a sequel to Ninja Scroll made with limited funding success. I’m sorry to say that it may be the end of an era for these traditionally animated features for adult audiences. I believe most animation studios in Japan are making more family friendly fare these days. Check out the teaser for Ninja Scroll 2 below. It’s like a demo reel for what could have been. 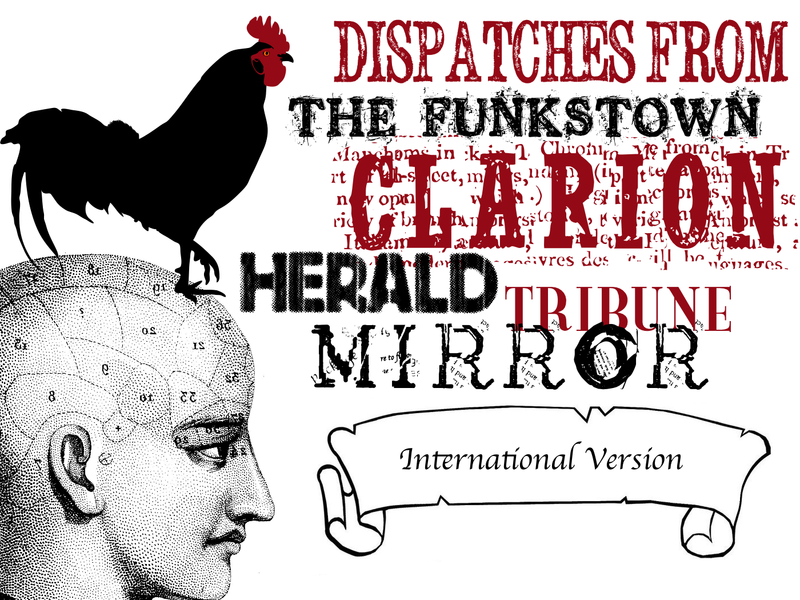 Some reviewers have called Patti White’s Chain Link Fence (Anhinga Press, 2013) a “post-apocalyptic” book, and it does have that sort of imagery. Most of the short, numbered poems include disjointed lists of objects either broken or hauntingly out of context: “a washtub, Pick-up / Sticks, four stones in a cardboard box.” There’s falling ash and peeling skin and wild dogs–very apocalyptic stuff–yet I kept thinking less of The Road and more of impoverished places and people I’ve known in the rural South. The poems follow Lucy, a person of indeterminate age, as she wanders a ruined landscape in a sort of dream state. In poem 9 there is a hint of some cataclysm in the “abandoned military vehicles” Lucy sees outside the window, but the poem goes on: “The / kitchen rings around her too…. 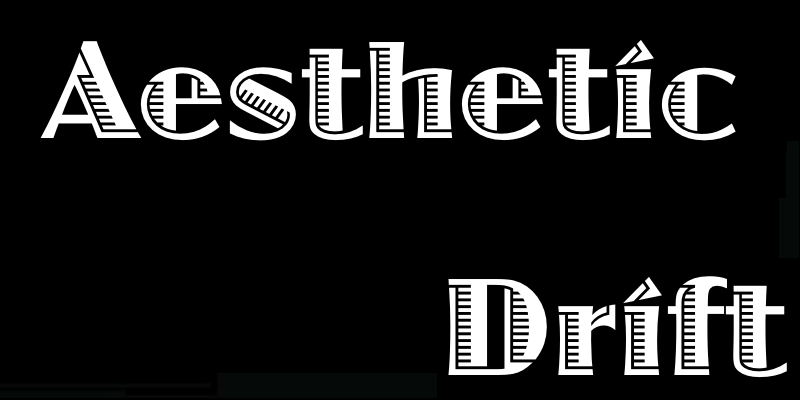 This is is not an earthquake…but / perhaps a precursor to something that shatters / inside her…” In poem 35, “Lucy walks in the scent of her dreams,” and in poem 47 “jasmine and roses bloom in her head.” Is the apocalypse she experiences the result of nuclear disaster or drugs and mental illness? Does it matter? The poems are brief, which is a wise choice, I think. Long poems in this vein might feel heavy-handed. 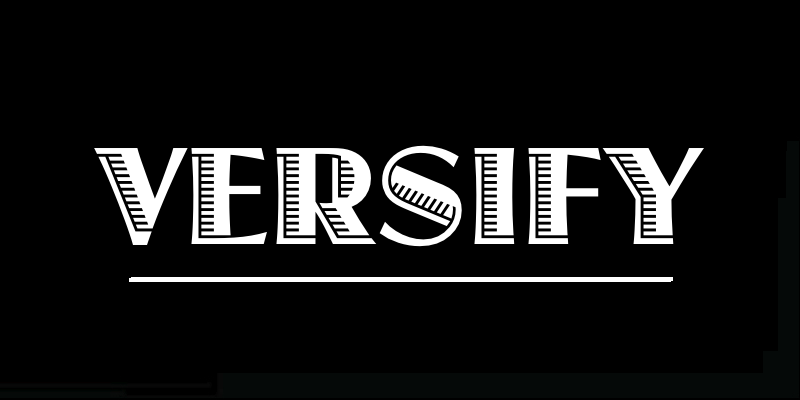 Instead the short pieces build on each other in an almost cinematic, fragmentary narrative. 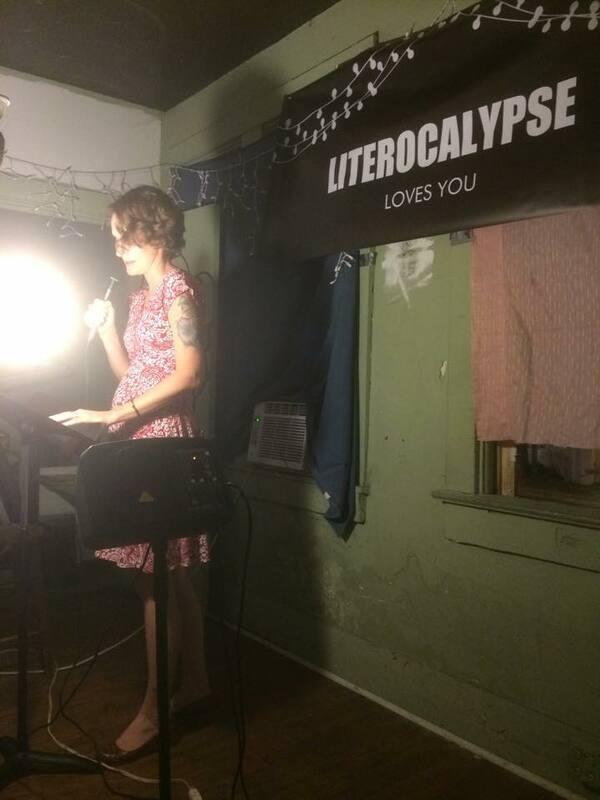 Although the book has welcome moments of lightness, I’m reluctant to call any of the poems hopeful; Lucy and the other characters are not getting out of the apocalypse alive. Pair with: a chipped glass of moonshine–not the trendy stuff they sell in Total Wine that tastes like a McDonald’s apple pie soaked in lighter fluid, but the kind that comes in a washed out mayonnaise jar, pressed upon you by a person whose very benevolence is terrifying. Amy Watkins grew up in the Central Florida scrub, surrounded by armadillos and palmetto brush and a big, loud, oddly religious family, a situation that’s produced generations of Southern writers. She married her high school sweetheart, had a baby girl and earned her MFA in poetry from Spalding University. Her chapbook, Milk & Water, was published in 2014 by Yellow Flag Press. Episode 163: David Z. Morris! 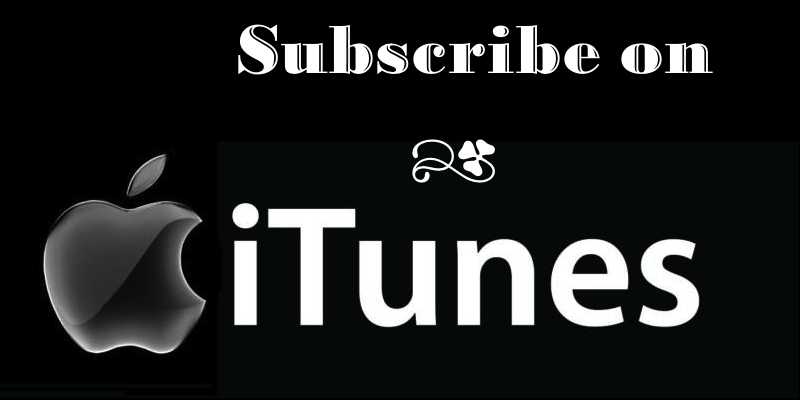 Episode 163 of The Drunken Odyssey, your favorite podcast about creative writing and literature is available on iTunes, or right click here to download. plus Shin Yu Pai writes about how Jhumpa Lahiri’s The Namesake changed her life. 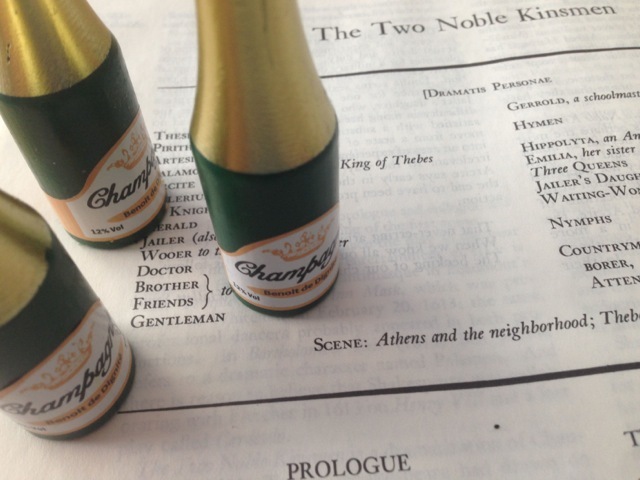 Rest in Peace, E.L. Doctorow. 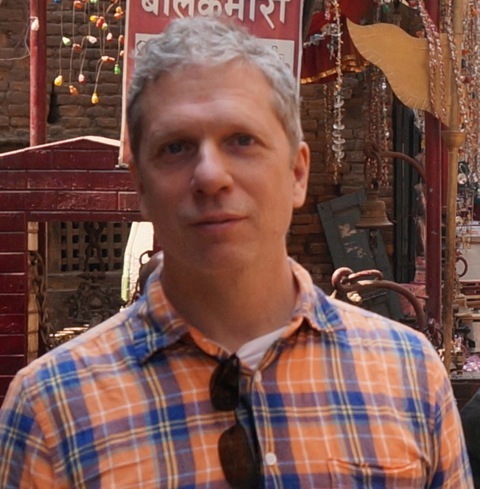 Check out David Z. Morris’s site, here. 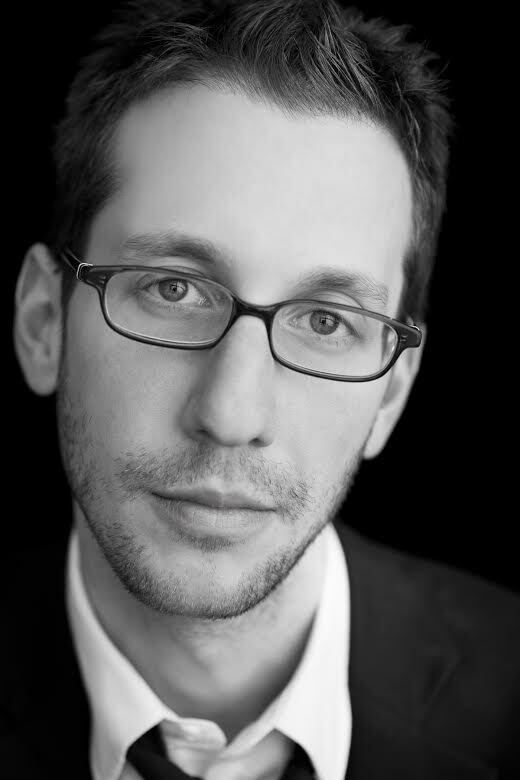 Check out his Art Basel essay here. 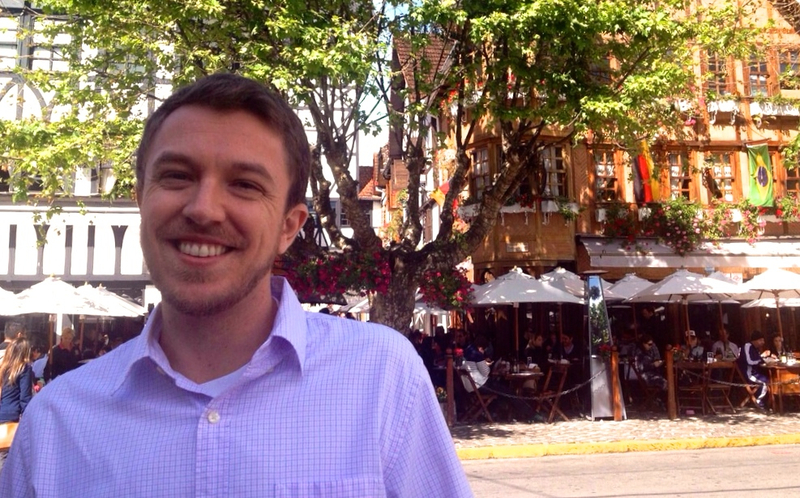 Check out his Iowa City music essay, “Only What is Dead Can Live Forever,” here. 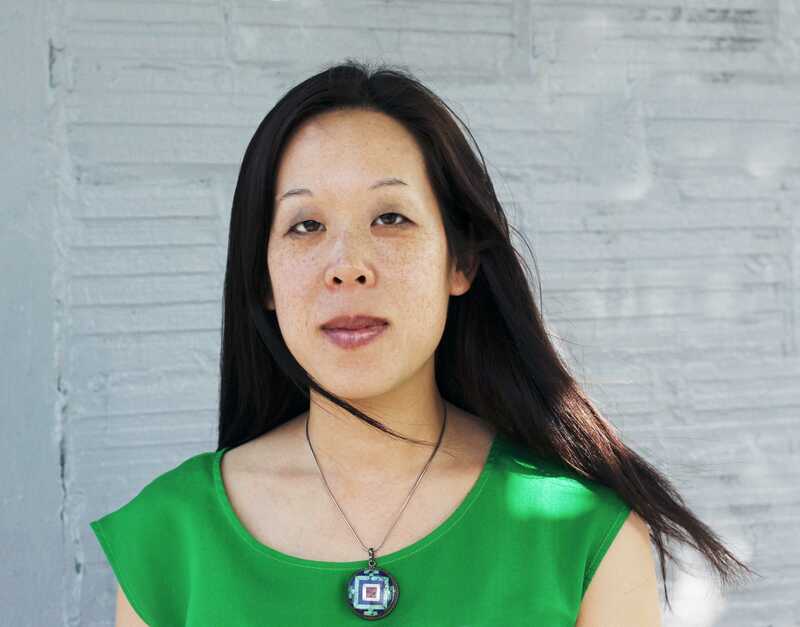 Check out Shin Yu Pai’s poetry and other work here. 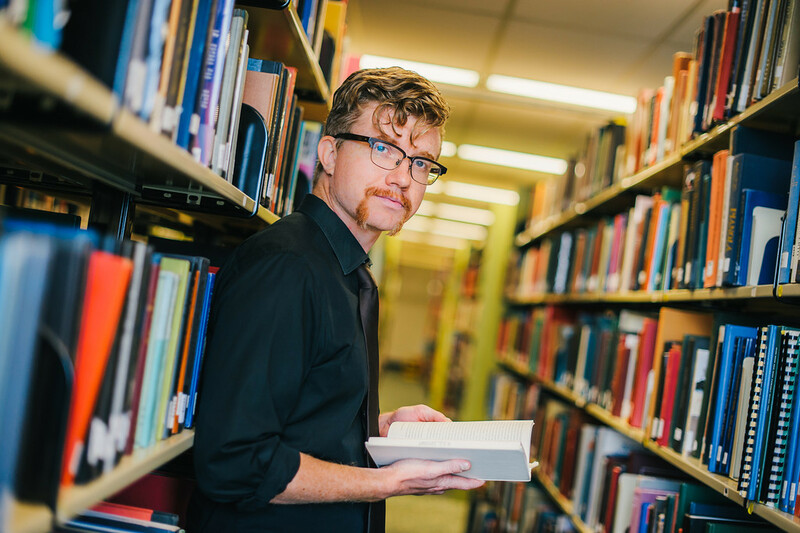 On Tuesday, August 11, at 7:00 P.M. at The Gallery at Avalon Island, Jared Silvia, Stephanie Rizzo, Teege Braune, Genevieve Anna Tyrell, and I will read original fan fiction for that month’s installment of J. Bradley’s prose reading series, There Will be Words. No more square dances in ninja movies! EVER. So I’ve had to scramble and find an appropriate substitute. The Octagon is on Netflix. It has ninjas. I know that Chuck Norris is an expert martial artist. I know that he studied martial arts under Bruce Lee. He did not, however, study acting under Bruce Lee, or anyone else to prepare for his role of retired karate champion Scott James in The Octagon. This becomes painfully obvious each time Norris pauses mid-sentence. He does. This. Again. And. Again. And. Again. He can’t remember his lines. But, O Curator of Schlock, don’t most of the movies you review feature bad acting? No, they do not! Lucio Fulci’s Zombie featured a member of the Royal Shakespeare Company in the lead role. Nothing will sink a movie faster than bad acting. That and a bad script. Schlock is supposed to be beautiful, people. I often point out when I lose the plot in the movies I review, but I think I lost the plot in The Octagon within the first ten minutes. I think the movie begins with Norris taking a ballet dancer home after a date, someone turns the lights in house off, she and her whole family get killed as Norris fumbles around in the dark. A disembodied voice says “Ninja” and I can’t figure out if this is Norris’s own thought or if he shares a psychic link with his brother who also happens to be an evil ninja. They’re estranged, mainly due to the fact that Norris beat his brother in some kind of obstacle course when they were kids and their father told him to disown him or something. I guess his evil ninja brother grows up to run a ninja training camp. They’re a bunch of random mercenaries who show up to join the ninja clan. They’ve even got an Irish guy who gets in a tizzy when he finds out they don’t serve potatoes at the camp. 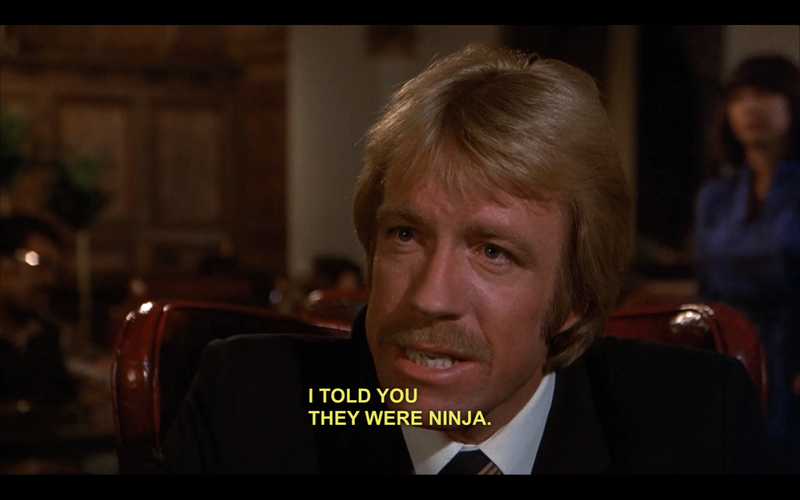 Norris tries to investigate the mysterious ninja clan, but keeps running into people who are confused as to what he’s talking about. “Ninja? Is that some kind of new Japanese stereo?” And then Norris shows up at a square dance class. I don’t know why. I’m sorry. Am I a testy today? I’m sure it has nothing to do with the fact that I just saw Terminator Genisys. Yeah, Skynet was going to use Ipads to destroy the world. 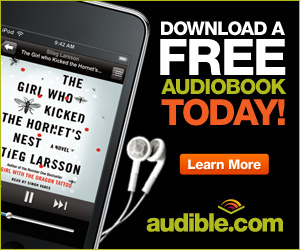 I think they took someone’s Terminator fan fiction and turned it into a major motion picture. Until next week, folks. There have been a lot of comic books made in the last hundred years. Millions of stories, with a large chunk of them revolving around superheroes. Most of these stories range from terrible to merely adequate. I love superheroes, but even I can’t defend each one. I don’t know if it’s the schedule of having to turn out a complete superhero tale each month (written, penciled, inked, colored, lettered, and edited), or if it’s just the nature of storytelling, but most superhero tales do nothing new. Sure, they plug in a different character into the protagonist spot, another in the villain spot, another in the best friend role, and so on. These stories can still be entertaining in the way that when you’re done you’re not upset you wasted fifteen minutes of your life on the comic, but rarely are they memorable. But, how does a writer bring something new to a genre that’s had millions of stories already told? In the fifth issue of 1985, Toby finds himself in the Marvel Universe. From the portal between dimensions, he lands on a street corner, still on the run from the Trapster, who is dispatched pretty quickly by a sedan as he chases Toby across the street. Toby heads to Avengers Mansion, where Jarvis, the butler (an actual butler in the comics, not software), hands Toby a pin and unconvinced Toby is being truthful, Jarvis tells him to get the Fantastic Four. 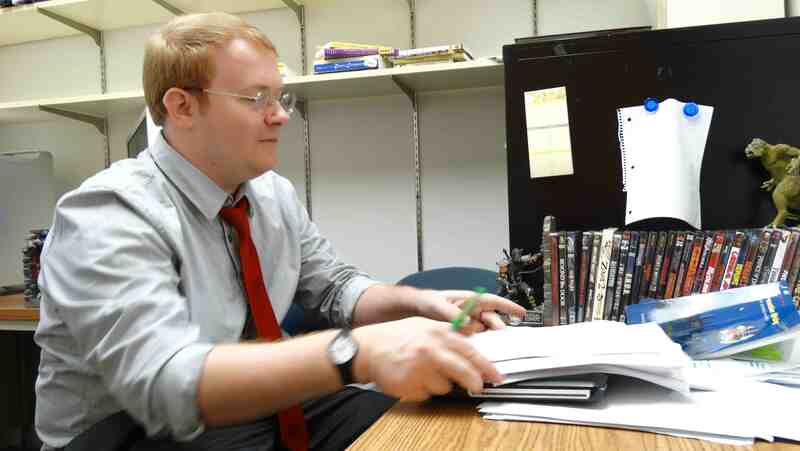 At the Baxter Building, Toby is made to fill out a form full-bureaucracy style beside a few others who also have an emergency that requires the help of the Fantastic Four. The superhero team will help on a first-come first-serve basis. 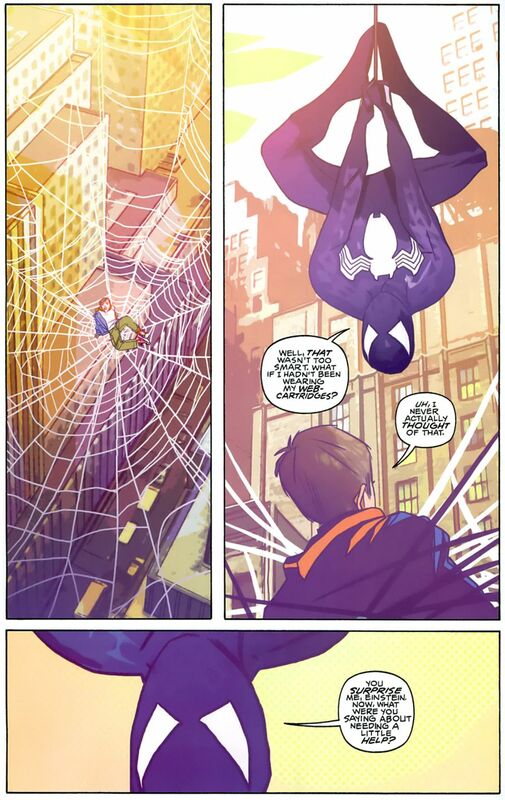 In need of help, Toby heads to the Daily Bugle to get Peter Parker’s help, which seems to work. Toby’s adventures in the Marvel Universe are fun and interesting, even though he doesn’t run into any superheroes until the end of his journey. The issue works because it’s rare that we get a look at the ground level of the Marvel Universe. I think that’s the key to doing something new—point-of-view. Style and structure can do a lot in a story, but to really deliver something new, I think the key lies with point of view. The superheroes remain the superheroes we know and love. They are reinvented. But, by getting a look at them from a different angle, in this case Toby’s, we can experience them in a new way. Perhaps this is why superhero films can’t seem to go even three films without losing steam (How many great superhero trilogies are there? I can’t think of any.) Ultimately, the superhero’s story, if they are to stay a superhero, can only be repeated so many times. Only so many times can new villains and supporting characters reinvigorate a series. But, a new point of view could create a whole new story. How interesting would it be to see a Superman film that is told from the point of view of a priest, someone who believes Man has been made in the image of God, that Man is God’s chosen creature? How would that affect the priest’s faith? Superman would stay Superman, but we as the audience would see a new side of the character. One of Marvel Comics’ greatest series, and one that I can’t help but feel that Marvel 1985 was meant to be a new version of, was Marvels. In Marvels, the reader followed Phil Sheldon, an everyman character and photographer for the Daily Bugle. 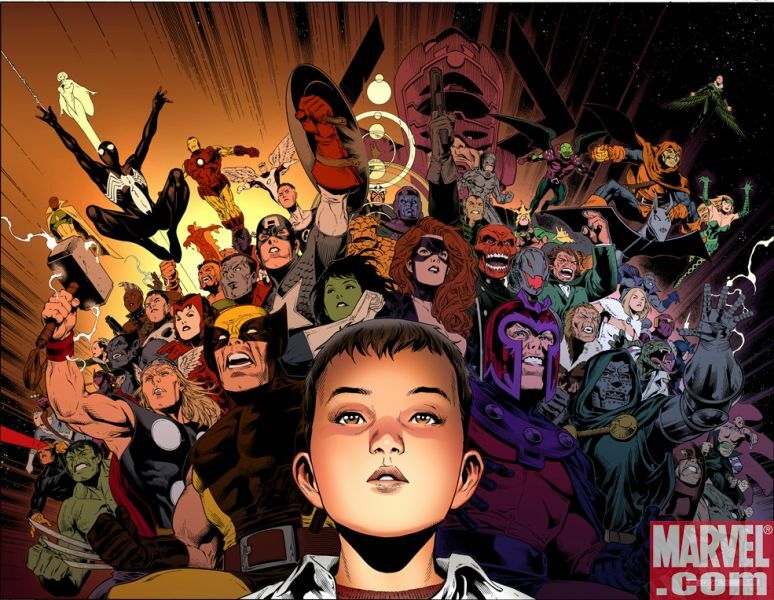 Readers saw the birth of the Marvel Universe through different eyes. And it was great. 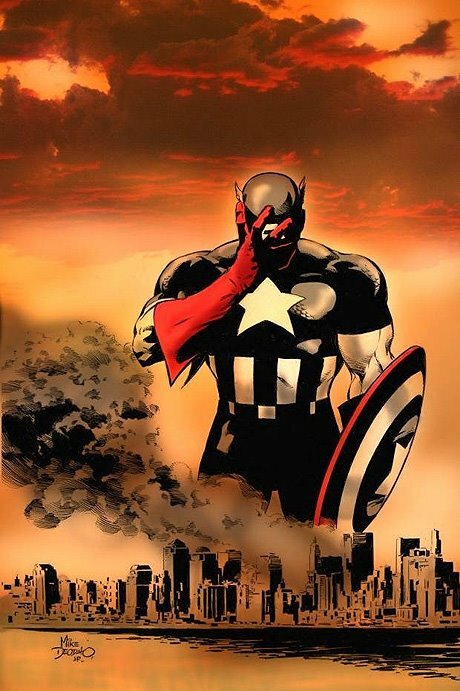 Readers got a new understanding of the comics, from the impact that Captain America had on the United States to why the X-men were hated for their mutant powers and the Fantastic Four were loved for their superpowers. 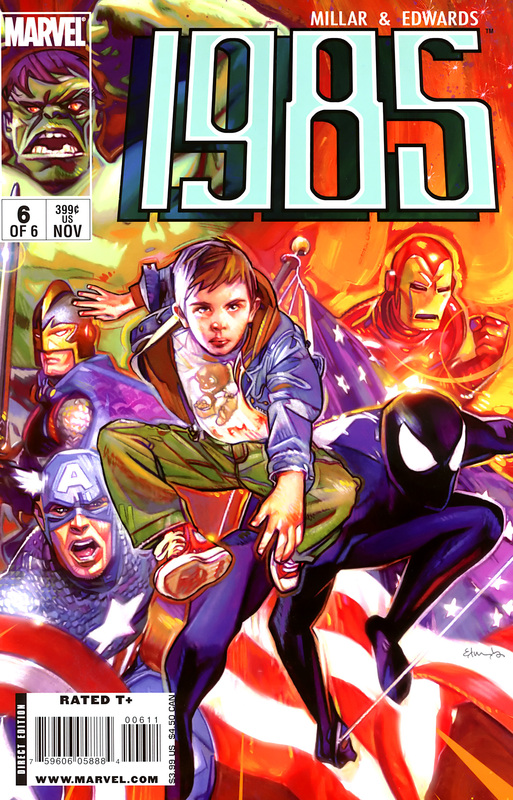 Marvel has done a few more comics like this in recent years, such as the Civil War tie-in Frontline. I really hope we get these types of comics as film someday. Not yet, it’s too soon, but in ten years, I think they would be wonderful. How many times can we see the same story over and over again? 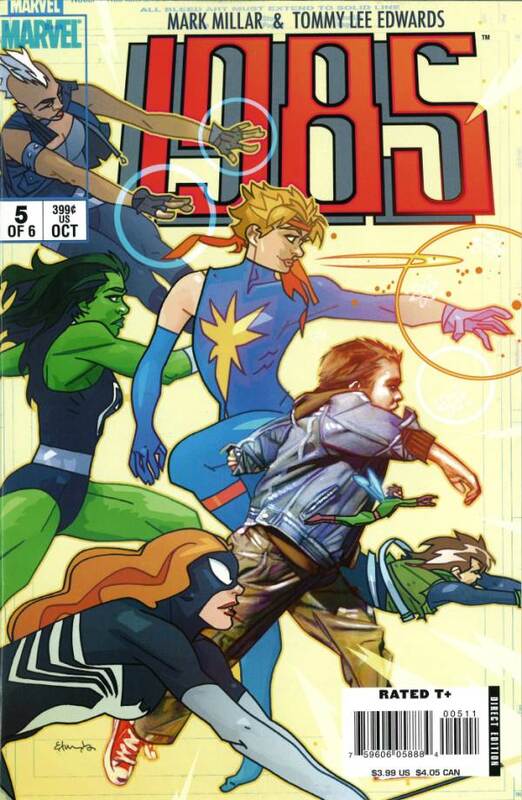 I’m not saying I dislike superhero comics, or I’m unhappy with what’s being published today. But, if a genre is going to thrive, it needs to evolve and offer readers new experiences. Point of view is a great way to do that. Some of the best Batman stories from the last twenty years have been found in Gotham Central, a comic about the police force in Gotham City. One of the best Superman stories is It’s a Bird, from the point of view of the writer of Superman comics. 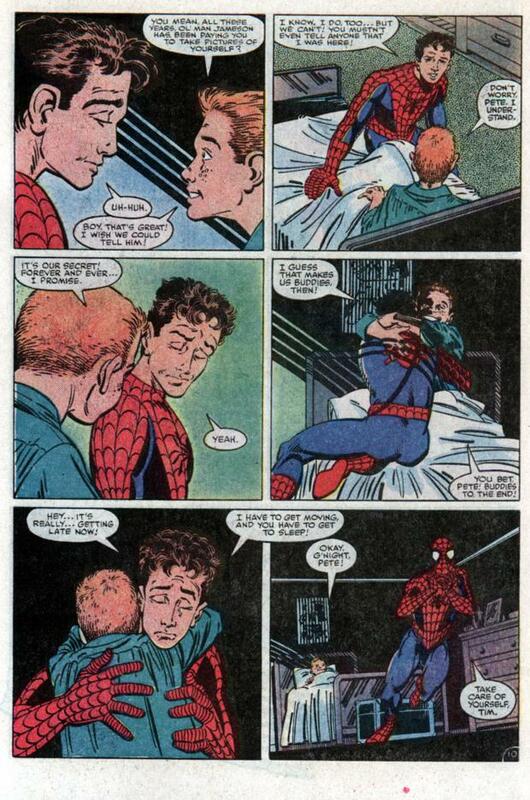 A great, and somewhat forgotten, Spider-man storyline (“The Kid Who Collects Spider-Man”) is about a child with leukemia whose dying wish is to meet Spider-man. The whole issue is Spider-man and the kid hanging out in the kid’s bedroom talking. And it was incredible because readers saw Spider-man in a different way. So, if you’re thinking of tackling a superhero tale, or any genre work that’s been done to death, try thinking of a different character as your narrator. You’ll get the best of both worlds—a story that has what readers love and something new. 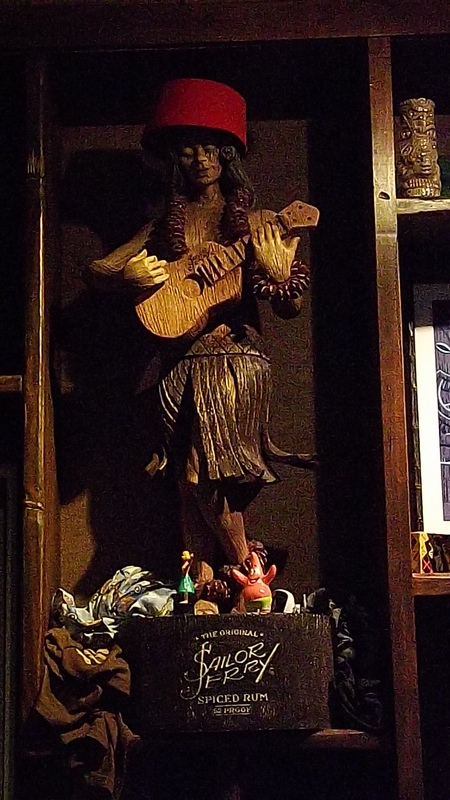 While Trader Sam’s Grog Grotto may be a boozy, whimsical pocket of tropical goodness in the theme park meccas twenty or so miles west of Orlando, the city beautiful’s best tiki bar is Aku Aku. 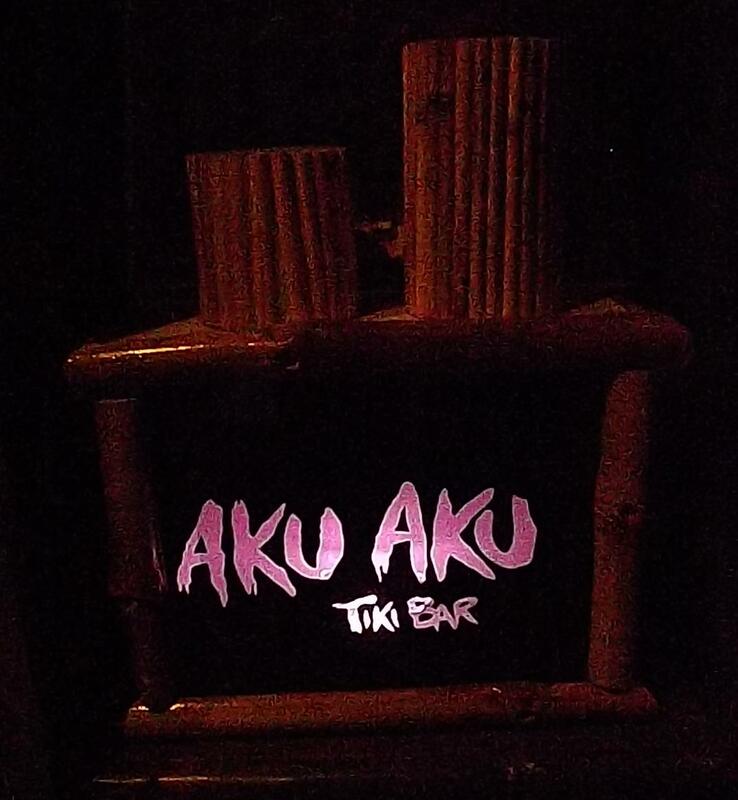 Located off Lake Eola and Thornton Parks, Aku Aku is far enough from the epicenter of mob alcoholism downtown to foster a sense of calm, letting those who are serious about their drinking to focus on the task at hand. Once again, I brought my brother with me as my drinking proxy (doctor’s orders). Now the term “tiki bar” is often a misnomer, especially in Florida where a thatched roof, Jimmy Buffet music, and Coronas seem all the requirements needed for the term. A true tiki bar is devoted to the touristy sense of the exotic that Hawaii held in the American imagination in the 1950s and early 1960s. 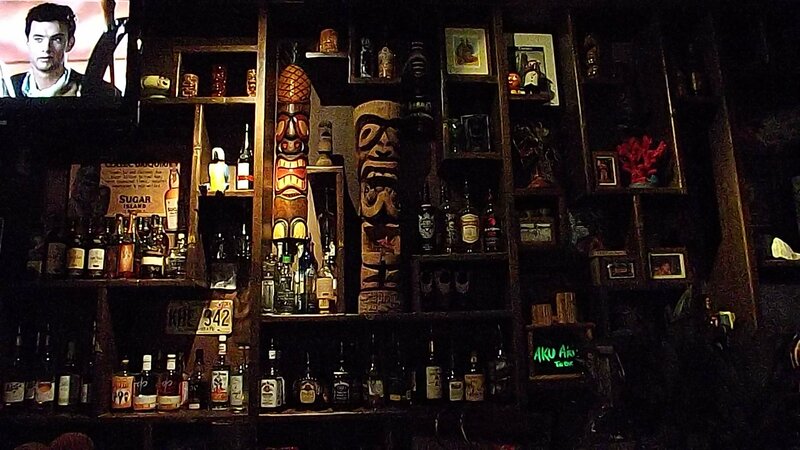 Aku Aku is a true tiki bar that will make tikiphiles dreamy. 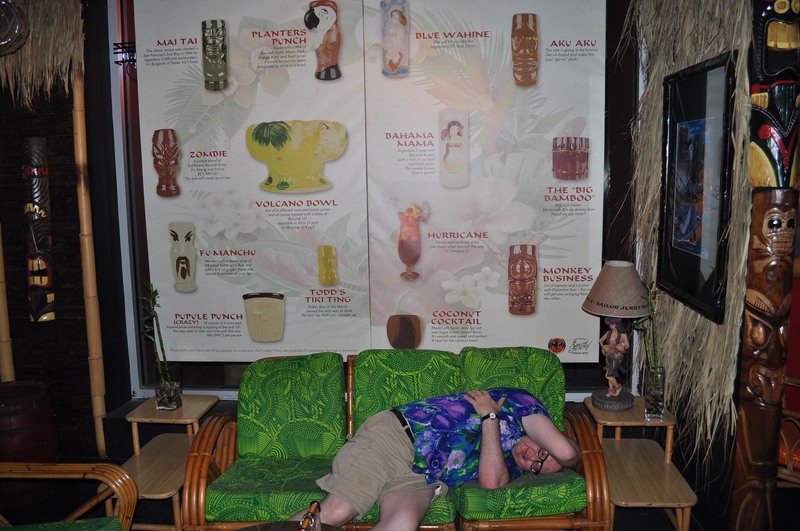 This modestly sized establishment is lined with dark bamboo, and features abundance of oversized Hawaiian images, not the least of which is a giant version of the drink menu. 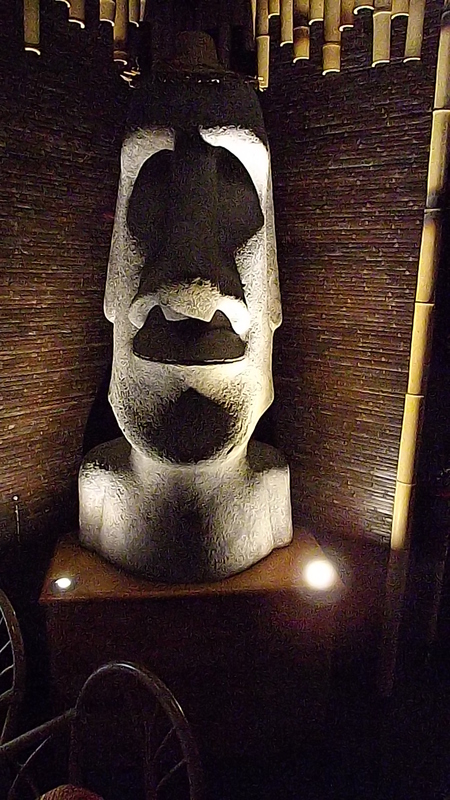 An Easter Island idol looms dourly at the door. (Aku Aku was the name of the archeologist Thor Heyerdal’s startling book about the history and culture of Easter Island, first published in 1958.) There are hula girl lamps and sculptures. There are glowingly ethereal puffer fish lanterns. And the cool darkness and the retro music of the place seem to banish the crush of downtown from one’s senses. 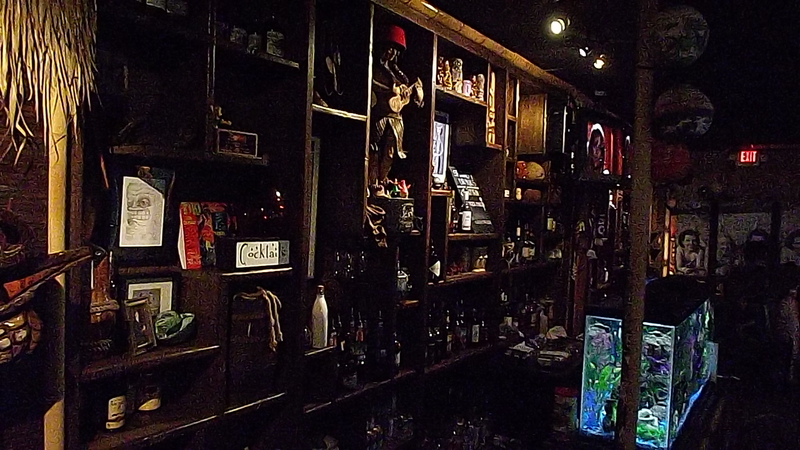 Behind the bar is a matrix of asymmetric shelves covered with sculpted mugs, outré tchotchkes, and bizarre artifacts such as Robert Mitchum’s calypso album. Also among the shelves is over 70 different rums. 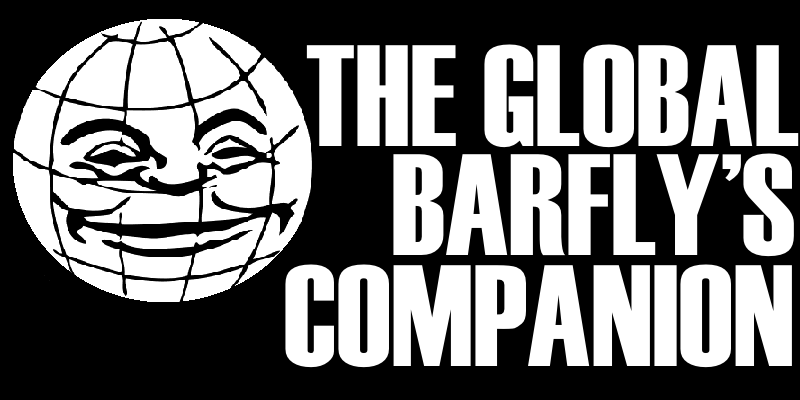 According to our bartender, Eric Soloman, their most popular rum is the Tiger Fucker, but they were out of vodka, which my brother wouldn’t have allowed to pass his lips anyway. James started with a mai tai (a recipe based on Trader Vic’s), and found it “Sweet and cool, from palate to gullet.” It was less minty than the Hippopota-mai-tai at Trader Sam’s, but equal in caliber. 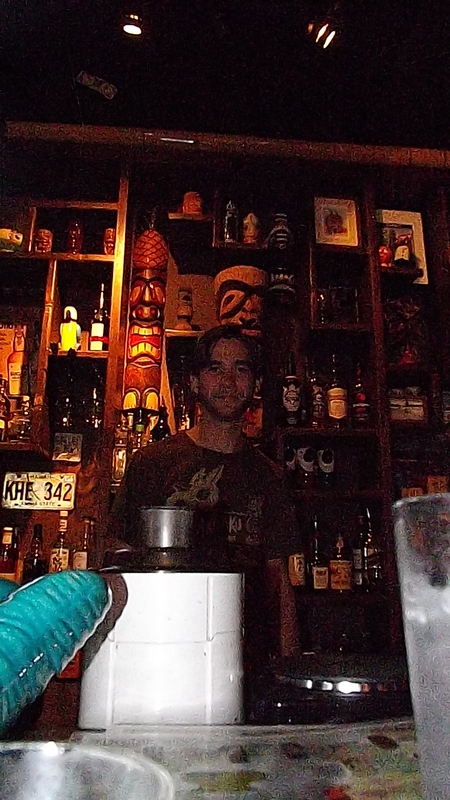 Next my brother tried the signature drink, the Aku Aku, which was even better than the mai tai. When I tried a sip, the sensation was gently sweet, like falling onto a giant, satin pillow. I get the feeling one could sip those through an afternoon or evening without the sugar getting too weird in one’s system. Eric is quite the mixologist. The bar was piled with oranges and pineapples that would later be juiced, and Eric proudly told us that Aku Aku makes its own simple syrup and grenadine. Such attention to fresh detail is a delight, and is discernible in the drinks themselves. 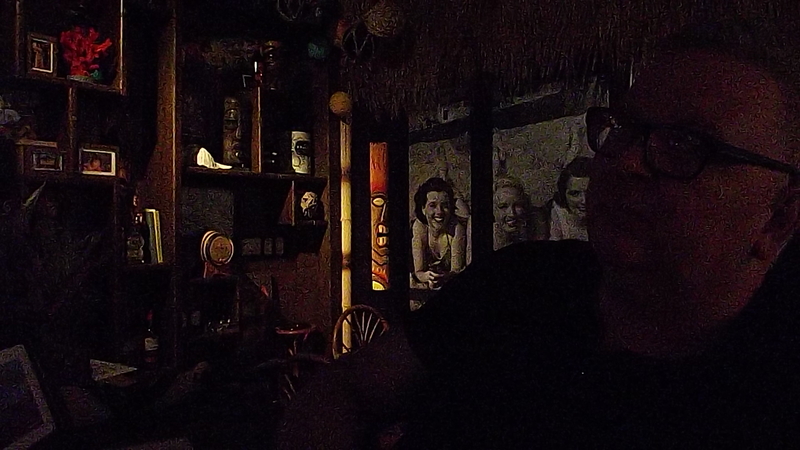 Like most tiki bars, there was a whiff of heady sweetness in the very air. While Louis Armstrong sang, “Ma Vie En Rose,” Eric helped my brother sample some sipping rums, and even concocted something with pineapple, rum, and peanut butter powder—a drink that as yet has no name, but was miraculously delicious, according to my brother. Aku Aku is the sister bar to the wonderful Stardust Lounge, which resides at the bottom of the stairs just a few feet from Aku Aku’s entrance. This is a deep inside joke. 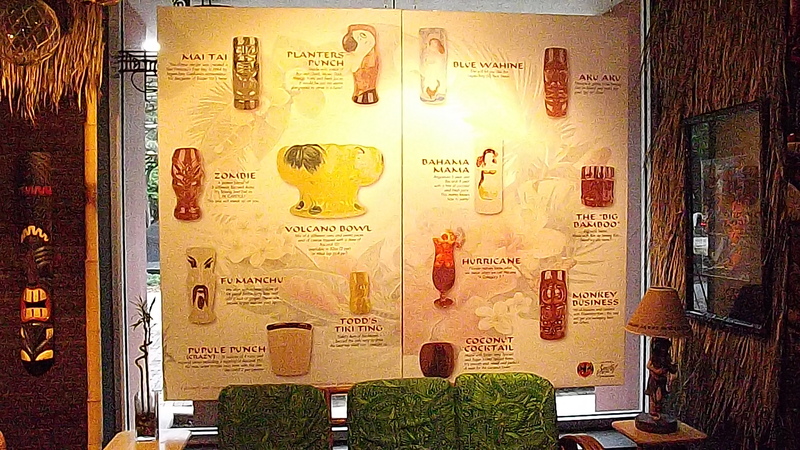 The Stardust Casino has a Polynesian restaurant and tiki bar from 1960 to 1980, and it was called Aku Aku. Todd Ulmer, the owner of both bars, knows how to create an immersive theme that imagines so much more than a place to yammer while watching sports while imbibing predictable drinks. But Stardust Lounge will have to wait another day. 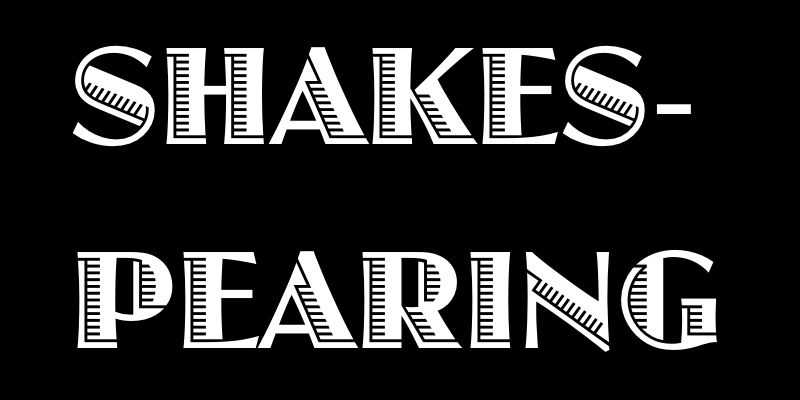 “There’s many a man alive that hath outliv’d/The love o’ th’ people.” This is Palamon in The Two Noble Kinsmen, congratulating himself that his impending execution will spare him this and “prevent/The loathsome misery of age.” It’s a line Shakespeare supposedly wrote. 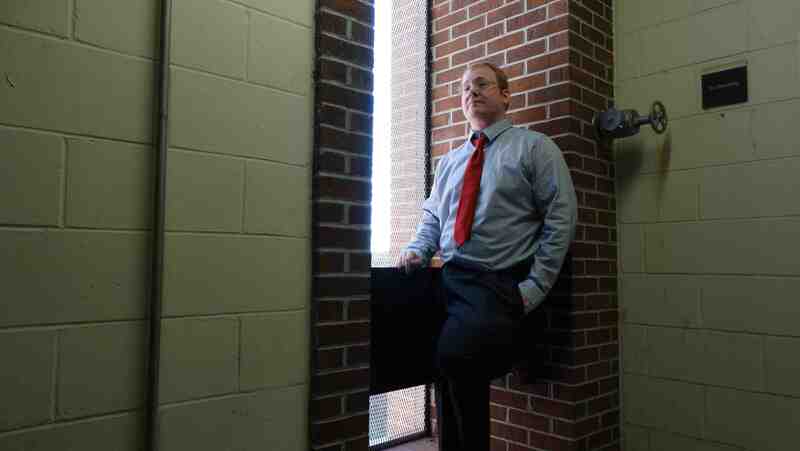 This world of cost and woe becomes knowing and sophisticated when Fletcher takes over. We take a couple of steps away from the story and feel ourselves breathe easier. (You can guiltily start to prefer Fletcher’s scenes.) 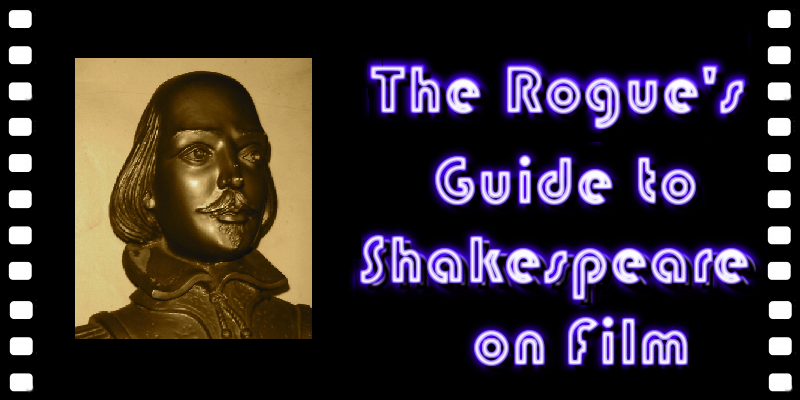 Perhaps this is most obvious in the treatment of the Jailer’s Daughter, whose lust for Palamon is refreshingly straightforward (“I would fain enjoy him”) but lacks the lived reality of desire that Shakespeare gives his love-struck women. The account of her madness—flowers, water, snatches of old songs—seems deliberately intended to echo Ophelia, but does so with the prettiness of a pre-Raphaelite painting. The charm of this works best in the friendship of Arcite and Palamon, the kinsmen of the title. In the funniest scene, the cousins, about to duel to the death for the love of Emilia, solicitously help each other into their armor. Arcite: Do I pinch you? Arcite: Is it not too heavy? But I shall make it serve. 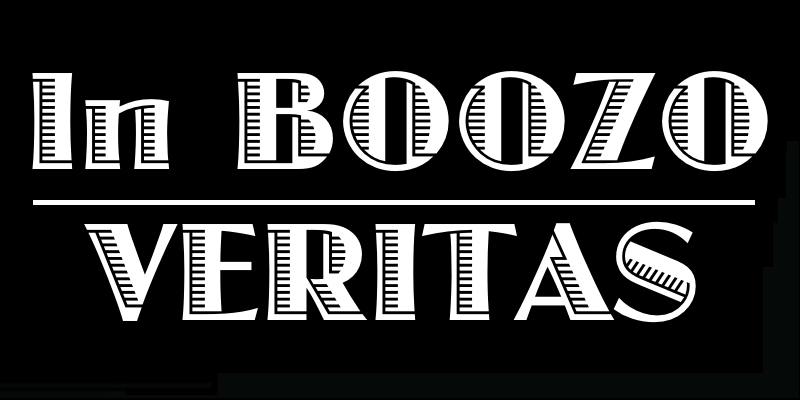 Episode 162 of The Drunken Odyssey, your favorite podcast about creative writing and literature is available on iTunes, or right click here to download. Photo by by Erika Dufour. 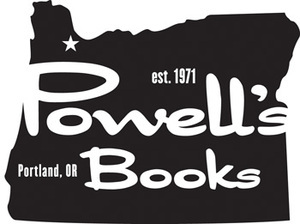 plus Don Campell about how finding a copy of John Krakauer’s Into the Wild on the Appalachian Trail changed his life. Not if, but when I realize my dreams of becoming a super villain, I want rest assure any of you potential henchmen out there that I will treat you fairly, and by fairly I mean not kill you whenever it’s convenient. I don’t understand why some super villains kill off their own henchmen. If the hero is holding your number 2 guy hostage, don’t shoot him just to show how ruthless you are. It’s bad for the morale of the other henchmen in your organization. 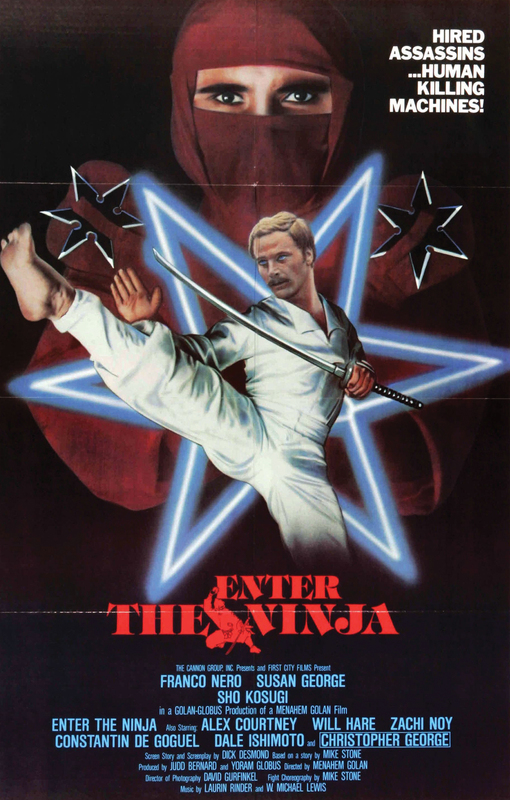 1982’s Enter the Ninja from director Menahem Golan…yeah, the same Golan of Golan & Globus (should be a David Mamet play) directed this film. The scuttlebutt is that Menahem Golan wanted to direct Death Wish 2, but Charles Bronson refused to star in it unless Michael Winner was at the helm. 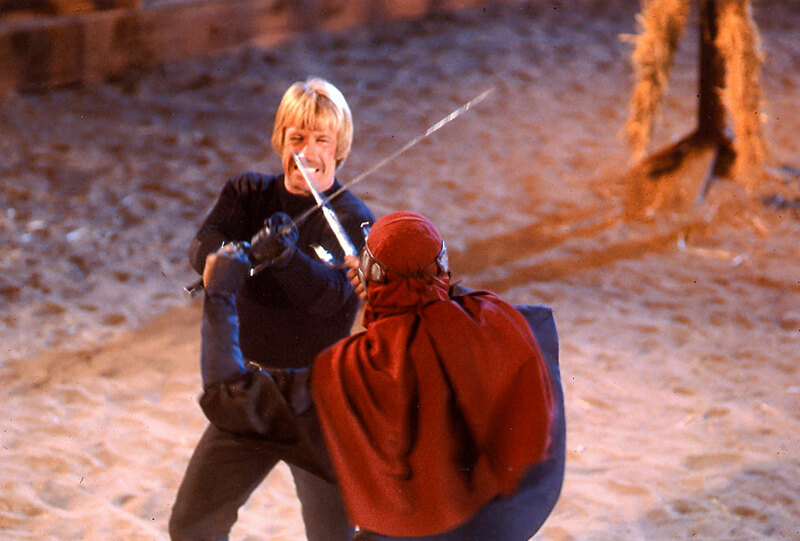 So Menahem Golan got Enter the Ninja as a consolation prize. 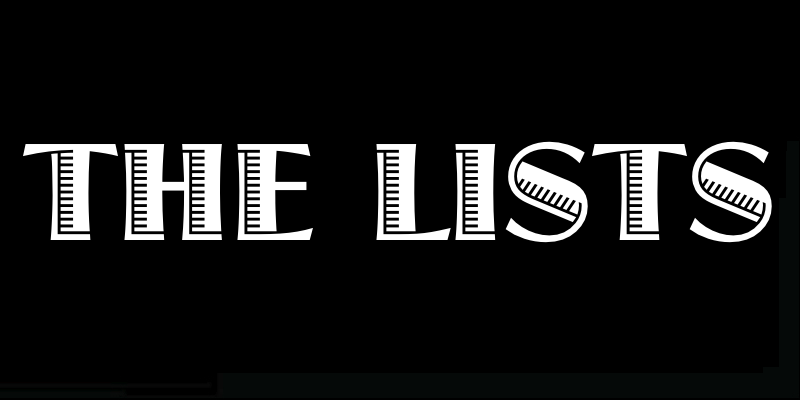 Enter the Ninja delivers what just may be the greatest opening credit sequence ever. 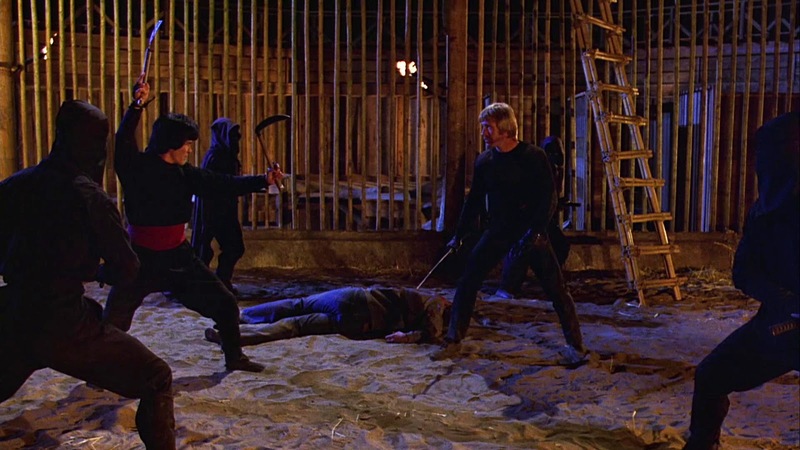 We get to see a ninja donned in black against a black backdrop showing off all of his ninja moves like prepping a poison dart or twirling sihs around. 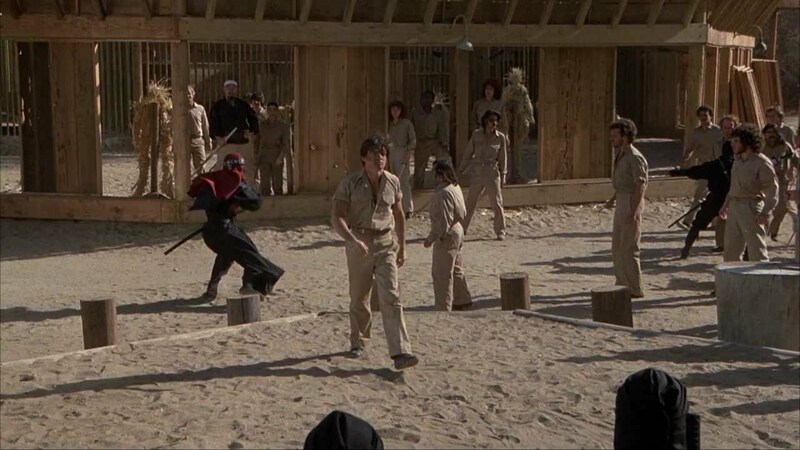 Then the movie starts and we see another ninja dressed in white start attacking all of these red ninjas and black ninjas, slicing them up with his ninja sword. The white ninja dives off a waterfall and fights another ninja underwater before making his way to some kind of dojo and lopping this old guy’s head off with his ninja sword. Woah! It feels like they put the last ten minutes of the movie at the beginning, but we learn it was just some elaborate training exercise. The old man comes into the dojo holding a prosthetic head. What? This doesn’t make any sense! I saw his head get chopped off, but I suppose this may be that ninja magic I’m always hearing about. 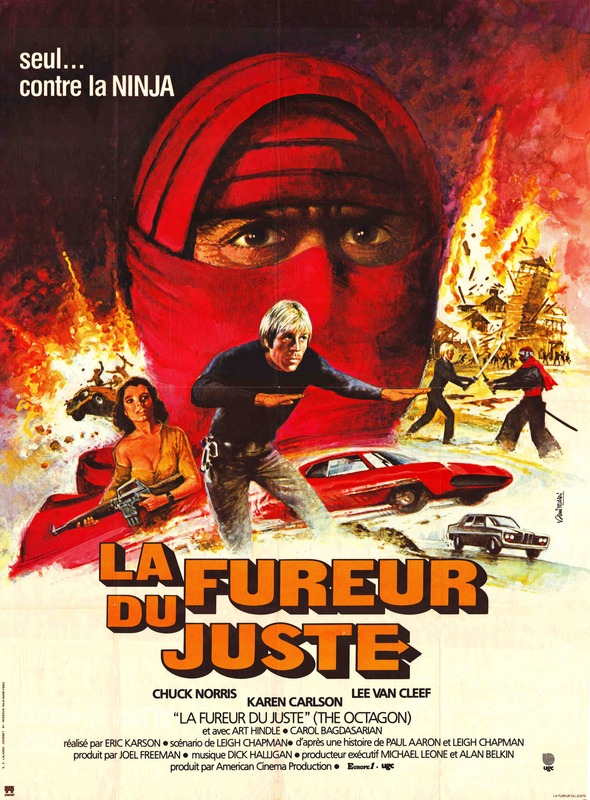 Then the ninja takes off his hood and it’s revealed that the ninja is none other than Franco Nero! That’s almost as good as getting Charles Bronson to be the ninja. Nero has a better mustache! 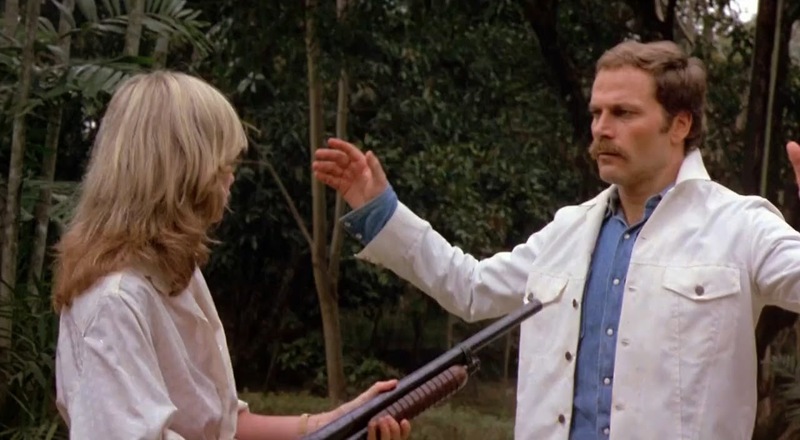 Anyway, Franco Nero is playing a guy named Cole who leaves Japan to visit an old war buddy named Frank (Alex Courtney) who now resides in Manila. Frank and his wife Mary-Ann (Susan George) run a coconut plantation. Apparently, there’s this guy with a French accent (or is it German) and a hook for a hand that’s making trouble for their hired hands. Cole uses his ninja moves on the guy, even managing rip the hook clean off which is kind of gross since all he’s left with is a bloody stump. 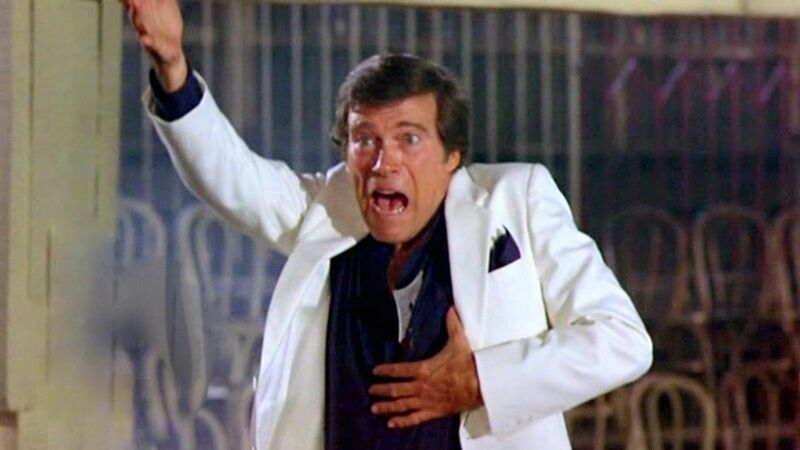 It turns out that the creep with a hook for a hand is working for Charles Venarius (Christopher George), a powerful CEO who wants that coconut plantation for the ocean of oil that lies beneath it. He hires a bunch of local goons who prove useless before sending his second-in-command to Japan to hire a ninja to take care of Cole. 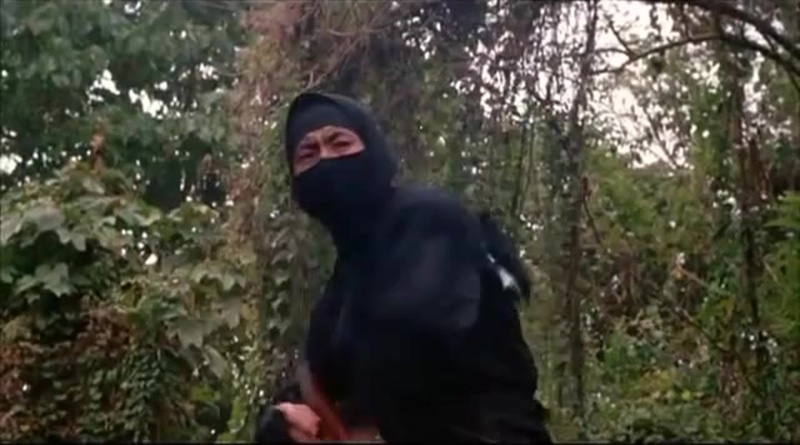 That ninja is played by none other than Sho Kosugi. 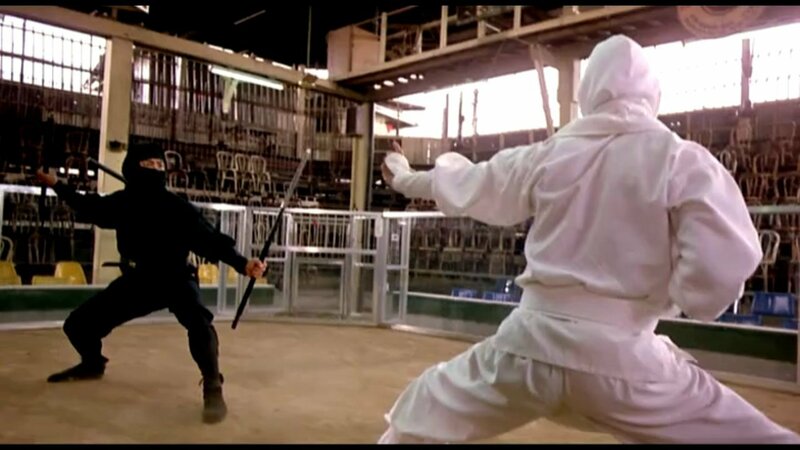 Who’s Sho Kosugi? I’m not sure, but he stars in the next two ninja movies I’ll be reviewing this month. Who is Susan George? She starred in Straw Dogs with Dustin Hoffman. What is Straw Dogs? It was a Sam Peckinpah’s first attempt at a romantic comedy. Don’t get between Franco Nero and his lemonade. Don’t pick a fistfight with the guy who has a hook for a hand. 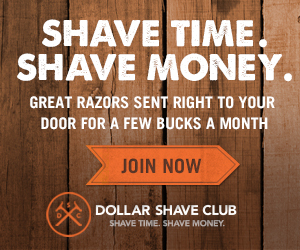 He may use it in your sweet spot. White suits should make a comeback. They’re so dapper. If you tell a ninja that you just want to talk and he keeps killing all of your bodyguards, guess what? He doesn’t want to talk. Dying with honor for a ninja means getting his head cut off. t’s amazing what kind of gems you can find on Netflix. In addition to Enter the Ninja, they also have Ghoulies III: Ghoulies Go To College.